Due to gravity the coolant containing suspended particles enters the tank containing the filtering nonwoven fabric, deposits solid particles as it passes through and flows out clean. 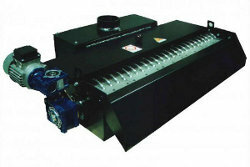 The progressive clogging of the fabric increases the water level above the filter until the level sensor reaches a maximum value. 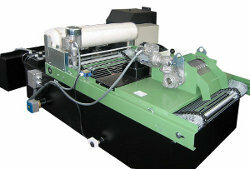 This activates the automatic set up of a new layer of fabric of the drum to start a new filtration cycle. 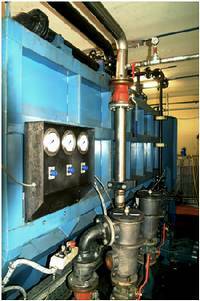 The coolant is purified, collected in the tub and then returned to the machine tool through a pump to be used again. The maintenance required by this system includes only the replacement of the roll of filter fabric and periodic cleaning of the sensor. Due to gravity, the coolant enters the filtering unit consisting of a drum activated by a dredging system which supports a permanent sheet made of stainless steel; the liquid deposits the slag and falls into the containment tank. This system allows for a very high degree of filtration since it is self-cleaning, thanks to a washing system that cleans the cake on the surface by means of the same purified liquid. This is an autonomous system that uses a strong magnetic field generated by special steel discs. The coolant is channelled through these discs which collect all the iron particles contained in the liquid using magnetic force, but also most of the non-ferrous particles through the mechanical action of the rotating drum. The system is kept clean thanks to a scraper blade that sweeps the sludge and discharges it through a special chute. In the presence of numerous machine tools, it is possible to create a centralized filtration system that allows for the liquid coolant to be purified through a single filtration unit and then collected in a storage tank. 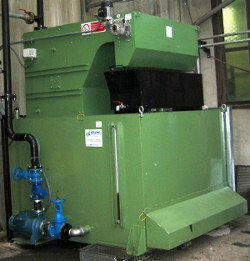 From this it is reintroduced to machines for reuse through a pumping system. The filtration system installed may vary according to the flow rate of the liquid, filtration needs, the fluid to be treated etc. When possible, self-cleaning filtration systems are also installed that do not require maintenance and that do not involve the disposal of waste materials.